Though we have a source image for this week's 'Shop Contest, this one will be thrown open to your imagination and whatever you can scrape together to illustrate it. The "Super Nincoffee Jr." shown yesterday provoked a comment thread of other console/kitchen appliance mashups that deserve some form of graphical representation. We know there are more out there too. Find them. Or, well, no; create them. 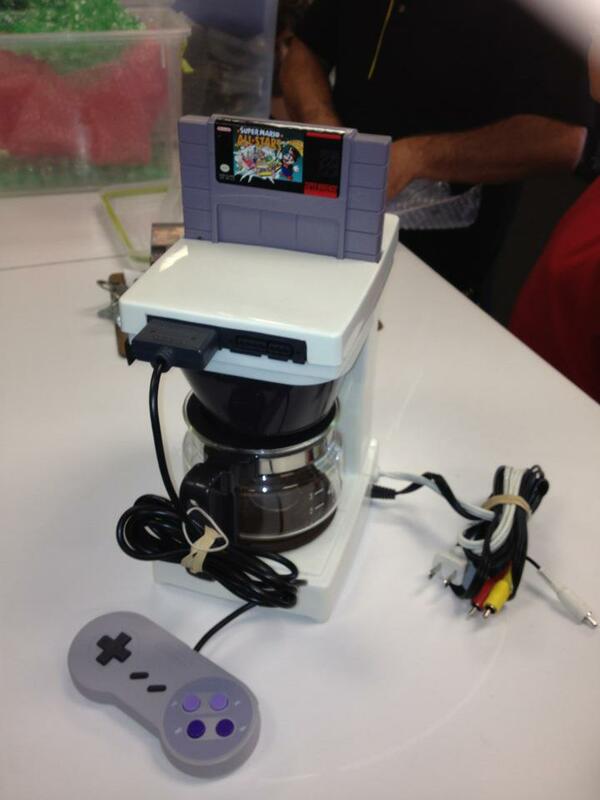 That's the the father-son project of Tyler and his Dad, a working Super Nintendo with a coffee maker casemod (the second they've built, actually). I know there's a longstanding Nintoaster joke out there, as well as a PlayStation 3 George Foreman grill. Cribbing off of either of those won't get you anywhere. Your job is to make either the Super Nincoffee Jr. better (or put it in a funnier situation), or reveal something that will make us stop longing for Ouya or Orbis or Durango or whatever's coming up next in console hardware.